Last week was pretty slow by the normally chock full Salzburg standards. I had two tests so we spent quite a bit of time studying. The vice mayor of Salzburg came into our Austrian Culture class one night, and listening to what he had to say about the challenges of governing a city like Salzburg was pretty interesting. Then Salzburg had its annual jazz festival so some of us ventured out into the city to listen to some music. Granted, jazz by Salzburg’s definition is not quite what most Americans would call jazz, but it was fun. Wednesday night we found ourselves listening to some sort of gypsy band that sang in Spanish. Thursday night we jumped around from venue to venue and ended up exploring some parts of Salzburg that we’d never walked through before. It was good to have a fairly relaxing week though because it meant we had sufficient energy to embark on our latest weekend adventure, this time to Budapest. Our train to Hungary left the Salzburg train station at 4:30 in the morning. After some consideration Rachelle and I, as well as our friends Mike and Phil who came with us, determined that it made the most sense to just stay awake through Thursday night and then sleep on the train for most of the morning. So Thursday afternoon I called to reserve a taxi for 3:30 AM and hung up a few minutes later only semi-confident that the woman at the taxi company had understood what I was telling her. When we were all standing in front of our dorm, freezing, at 3:30 and there was no taxi I wasn’t entirely surprised. I was however, a little nervous we were going to miss our train. After a few minutes of being creeped out by a strange car driving down our street backwards, discovering that it was in fact the newspaper delivery man and not a serial killer, and fretting about our lack of a ride, we walked towards the main road in hopes of finding a random taxi. We had just gotten around the corner from the dorm when we saw just such a taxi coming towards us. Much jumping up and down ensued. The taxi put his turn signal on as though he saw us, but then he turned down the street we had just come from. Assuming he was simply turning around, this did not concern us greatly at first. When we realized he wasn’t coming back for us we realized he probably had been our original taxi all along and was now waiting outside of our dorm. Rachelle proceeded to run down the street to fetch him. Just after she’s turned the corner Mike and Phil and I witness a bus pull out of the bus depot a block from our building. It’s 3:45 in the morning. You’re lucky to ever catch a bus past midnight here in Salzburg. And not only was this bus randomly leaving the depot in the middle of the night, it had Main Train Station as its destination. The three of us just about died. We have since declared it a Phantom Bus. Maybe it never existed. Eventually Rachelle came back with our taxi and we made it to the station with plenty of time to spare. When we got on the train though we suddenly realized we had no idea where to sit. Our tickets had an assigned compartment, but all of the train’s other passengers had just come from Switzerland in the middle of the night and understandably were all sprawled across the seats sound asleep. We clunk up and down the train a bit before finally asking someone where we ought to be. Of course it’s four cars behind our current position, so we traipse all the way back. Upon finding our correct compartment we discover two women fast asleep. Awkward. We have to wake them up. They speak Hungarian. Eventually we all get seated and attempt to sleep for the seven hour trip. We got to Budapest groggy and hungry and quickly discovered we had no idea what was going on. We came out of the train station into a chaotic construction scene and had only a vague plan that involved getting to the metro. Where the metro was we hadn’t a clue. Fortunately someone pointed us in the right direction of the underground, and we lugged our luggage down the long escalator only to be reminded that we had no Hungarian currency, and we couldn’t buy metro tickets in Euros. Cue trekking back up the escalator and venturing out into the surrounding streets in search of an ATM. This was no easy feat. When we did find one we had no idea how much money we needed, as the Hungarian forint was so inflated at one point that a meal might cost 1000 forint. Really strange to see an ATM spit out a bill with 10,000 written on it. Money in hand we guessed our way through the metro and to our hostel. The hostel was in the middle of yet another construction site, and a crowd of rowdy people carrying flags seemed to be standing directly in front of our building. Confused, tired, and growing increasingly annoyed at our inability to read Hungarian, we fought through the crowd and to the hostel door. Now the the outside of this building was possibly one of the sketchiest buildings in the history of ever. We had already become nervously aware of the general rundown appearance of parts of the city, and so it was with a great deal of trepidation that we hiked up the several flights of stairs we had to take to the hostel itself. Much to our delight, the hostel turned out to be a perfectly lovely little hotel, with free cookies and a lot of other travelers willing to share their various travel stories. We ate lunch that first day at a Hungarian restaurant not far from our hostel. The rest of the day we spent napping and wandering around, getting our feel for the city and the things we wanted to see and do. It was also a Hungarian national holiday, celebrating the anniversary of their 1956 Revolution. We saw a huge parade of people carrying Hungarian flags and lots of the buildings in the city were decked out in red, white, and green. 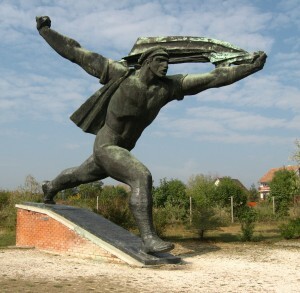 Though the revolution was ultimately unsuccessful, Hungarians are still very proud that theirs was one of the first attempts to overthrow communism in the Eastern Bloc. Saturday we woke up and set out along Vaci Street, one of Budapest’s main tourist drags, until we got to the Central Market Hall. The first floor of the huge building is mostly food stands with vegetables and fruits spilling out everywhere. Upstairs is filled with souvenir stalls and people trying to sell stacking dolls, lacy tablecloths, and beer steins. We wandered through the maze of aisles, bought some neat pastries (real whipped cream! ), and then left to see more of the city. Exploring seemed to involve climbing a lot of hills. 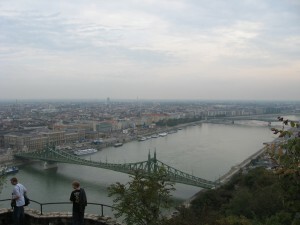 Budapest is actually two cities, Buda and Pest, divided by the Danube River, and the Pest side is relatively flat, but the Buda side has several large hills. We climbed up endless amounts of stairs, and from there we could look out over a lot of the city. We saw the former palace, which is now a museum, and Fisherman’s Bastion, which is some sort of former fort overlooking the river. To me it just looked like a sandcastle. The guys went into a military history museum, but Rachelle and I sat outside rather than stare at a bunch of old war stuff. That night I had one of my favorite foods for dinner- cabbage and noodles! Yum. After being completely dumbfounded by the oddness that was Memento Park we took the bus back into the city and then attempted to get lunch. Of course it was Sunday so not much was open. What we did come across was a cheap Chinese place on a little side street. Questioning our choice in eating establishment we walked in and proceeded to point and order whatever it was that looked vaguely familiar. The woman at the counter spoke more English than we’d anticipated so communication wasn’t as tricky as anticipated. The real treat came when she put our food on the plates and then stuck them in the microwave. Reheated Chinese food. Oh boy. But it wasn’t too bad, and no one died of horrific food poisoning so chalk it up to an entertaining cultural experience. 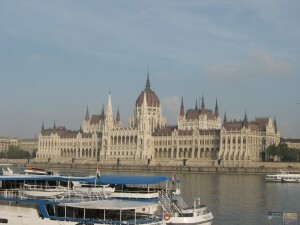 After we ate lunch we wanted to take a tour of Budapest’s awesome Parliament building. Of course we missed the last English language tour of the day by about a half an hour. Instead we went to Margaret Island in the middle of the Danube and marveled at what is supposedly a resort area in the summer but basically looked like a bunch of overgrown tennis courts and lots of shuttered bars and hotels. But the fall leaves were pretty. Later that day we hung out with the Australians and other Americans staying in our hostel and went out to dinner with a French guy who was there as well. Our last day we had just about run out of things to do and see but we soldiered on. We had yet to see Andrassay Street, a high end shopping district with some of the city’s historical sites, so we walked up that. There were so many Western stores that it was hard to imagine what the city must have been like under communism twenty years ago. We trudged through the misty rain and made it to Hero’s Square at the end of the street. The square is a monument to the 1956 Revolution and is flanked by a few museums and whatnot. We wandered through the square and into City Park which has its own castle, zoo, and circus. We saw the castle, but mostly we just walked around and enjoyed the fall leaves (Rachelle, our resident California girl, especially). After still more walking we ended up back at the Central Market Hall to spend the rest of our Hungarian forint on some pastries. Our train left at 6 Monday night, and we were lucky enough to get a six person compartment to ourselves so we could stretch out. The train lurched its way across the two countries, getting in to Salzburg at 1 AM, a half hour later than it was supposed to be. Luckily, our 8:30 class on Tuesday had been canceled so we unpacked, collapsed, and slept for quite some time. All in all, it was a great trip to someplace that we picked kind of spontaneously. Everyone was really friendly, and it was unlike any other place I’ve been so I’m super happy we went. Today we just bought more-expensive-than-necessary tickets to Florence, Italy for next weekend so more travels to come. For the next week and a half though I’m going to be doing a lot of homework. And we’re all excited for Halloween, Salzburg style.